I love chorizo but chorizo didn’t always like me. Recently I found a local smoked meat market that makes their own chorizo. It is much lower in fat and doesn’t cook out an excessive amount of grease the way some do while maintaining the spicy flavor. First thing I wanted to make was soup. 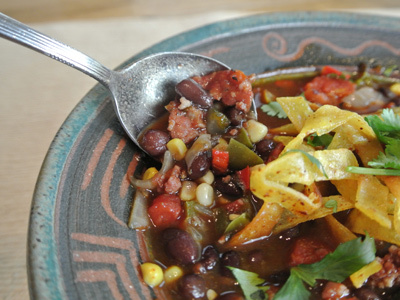 I imagined a healthy and tasty black bean soup loaded with beans, chiles and corn and now a chorizo sausage that was lighter with very little fat. It was terrific if I do say so myself! And the best thing of all was I didn’t have to share. Those who won’t touch beans don’t know what their missing! 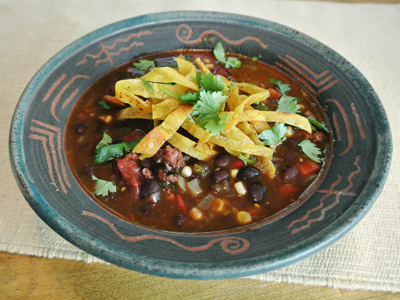 The soup ingredients are black beans, chorizo sausage, onion, garlic, jalapeno pepper, fresno red pepper, roasted poblano pepper, roasted corn, chicken stock, epizote, ancho chili powder, and Mexican oregano. 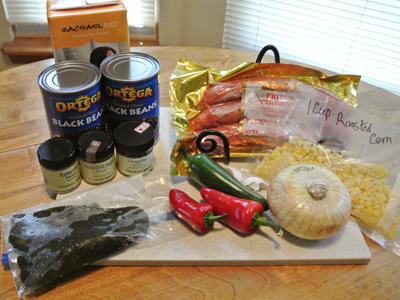 I took one link of the chorizo sausage, which was just about 1/2 pound, sliced it and placed in the dutch oven. I actually needed to add a drizzle of olive oil as it was so lean it needed a little oil to cook. It started to crumble as it cooked. 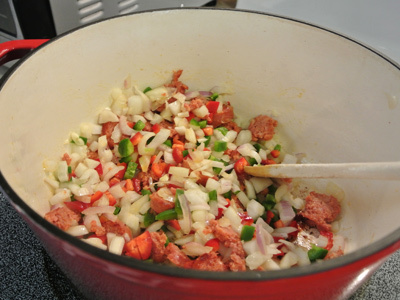 Add all the chopped onion, garlic and peppers to the pot. 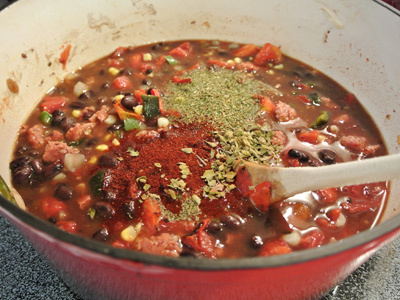 As they sweat it out, begin to loosen some of the chorizo from the bottom of the pot. 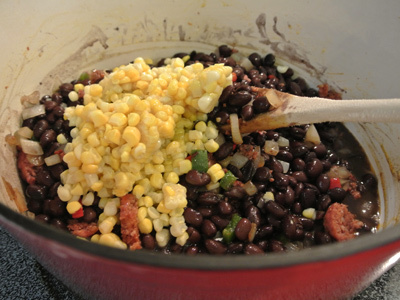 Next comes the roasted corn and black beans. 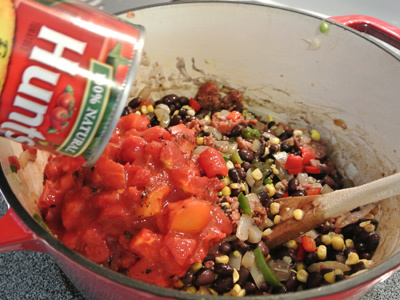 A can of fire roasted tomatoes. Bring it just to a boil, then cover the pot, turn the heat down to low and simmer for 30 minutes to an hour. 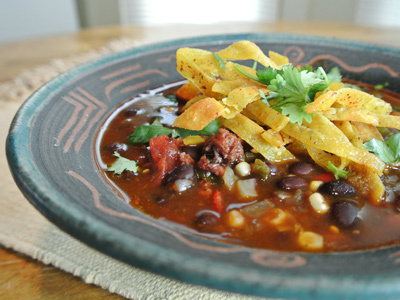 I have to have a little crunch and added some crispy tortilla strips to go on top. Mmm, tasty and healthy too! Heat a dutch oven over medium high heat. 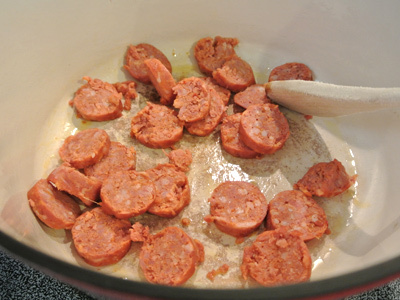 Add the sliced chorizo to the pot and drizzle olive oil if needed. Begin to brown the sausage in the pan. 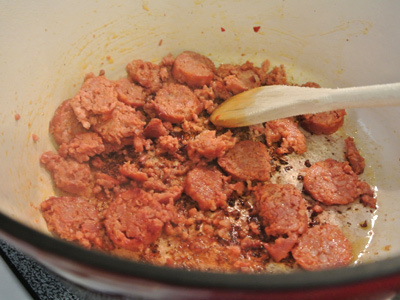 If too much grease cooks out of the chorizo sausage, drain the sausage and remove any excess oil from the pot. 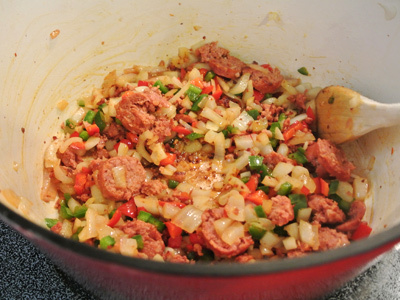 Stir in the chopped onion, garlic and peppers into the pot. Let them cook until they become soft and translucent. 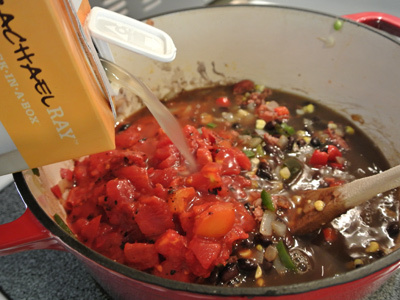 Next, add the beans, corn, tomatoes and chicken stock to the pot. Stir in the spices and bring just to a boil. 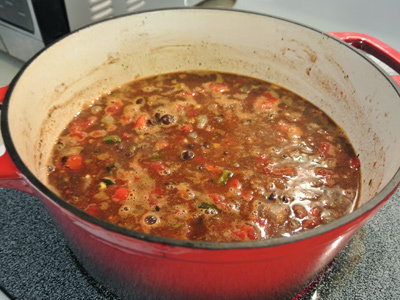 Cover, turn down the heat and let simmer for 30 minutes to 1 hour. 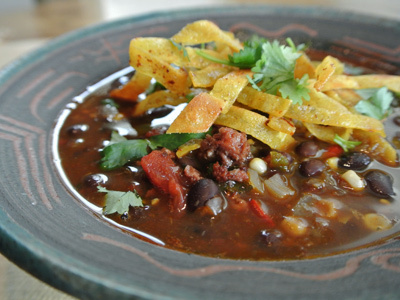 Serve with crispy tortilla strips, avocado, cilantro, sour cream or cheese.